Allotropes are differing structural forms of the elements. The best known example is that of carbon, which comes as diamond and graphite, along with the relatively recently discovered fullerenes and now graphenes. Here I ponder whether any of the halogens can have allotropes. A better model for the mechanism of Lithal (LAH) reduction of cinnamaldehyde? Previously on this blog: modelling the reduction of cinnamaldehyde using one molecule of lithal shows easy reduction of the carbonyl but a high barrier at the next stage, the reduction of the double bond. Here is a quantum energetic exploration of what might happen when a second LAH is added to the brew (the usual ωB97XD/6-311+G(d,p)/SCRF=diethyl ether). Mechanism of the Lithal (LAH) reduction of cinnamaldehyde. The reduction of cinnamaldehyde by lithium aluminium hydride (LAH) was reported in a classic series of experiments,, dating from 1947-8. The reaction was first introduced into the organic chemistry laboratories here at Imperial College decades ago, vanished for a short period, and has recently been reintroduced again.‡ The experiment is really simple in concept; add LAH to cinnamaldehyde and you get just reduction of the carbonyl group; invert the order of addition and you additionally get reduction of the double bond. Here I investigate the mechanism of these reductions using computation (ωB97XD/6-311+G(d,p)/SCRF=diethyl ether). Ionizing ultra-strong acids with water molecules. My previous posts have covered the ionization by a small number of discrete water molecules of the series of halogen acids, ranging from HI (the strongest, pKa -10) via HF (weaker, pKa 3.1) to the pseudo-halogen HCN (the weakest, pKa 9.2). Here I try out some even stronger acids to see what the least number of water molecule needed to ionize these might be. How many water molecules does it take to ionise HI? Why is this post orphaned from the previous? In order to have the opportunity of noting that treating iodine computationally can be a little different from the procedures used for F, Cl and Br. How many water molecules does it take to ionise HF and HBr? No doubt answers to the question posed in the previous post are already being obtained by experiment. Just in case that does not emerge in the next day or so, I offer a prediction here. How many water molecules does it take to ionise HCl? According to Guggemos, Slavicek and Kresin, about 5-6!. This is one of those simple ideas, which is probably quite tough to do experimentally. It involved blasting water vapour through a pinhole, adding HCl and measuring the dipole-moment induced deflection by an electric field. They found “evidence for a noticeable rise in the dipole moment occurring at n≈5–6“. Chemistry in the early 1960s: a reminiscence. I started chemistry with a boxed set in 1962. In those days they contained serious amounts of chemicals, but I very soon ran out of most of them. Two discoveries turned what might have been a typical discarded christmas present into a lifelong career and hobby. 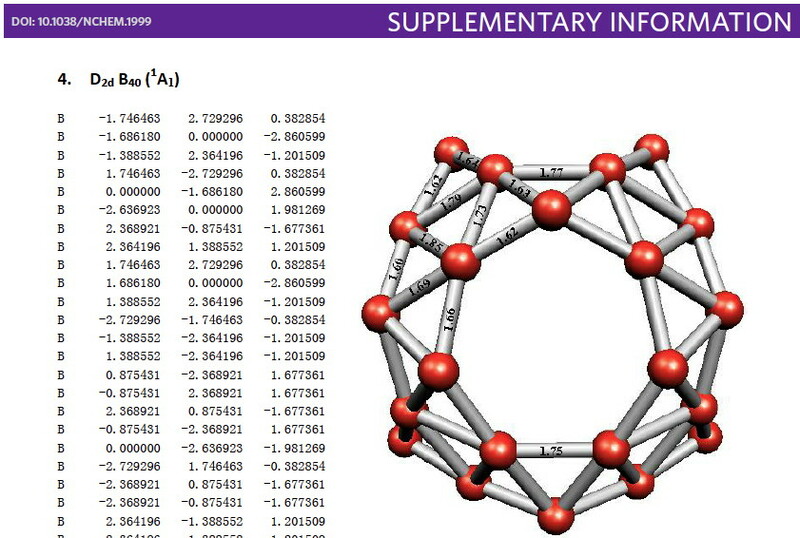 Whilst clusters of carbon atoms are well-known, my eye was caught by a recent article describing the detection of a cluster of boron atoms, B40 to be specific. My interest was in how the σ and π-electrons were partitioned. In a C40, one can reliably predict that each carbon would contribute precisely one π-electron. But boron, being more electropositive, does not always play like that. Having one electron less per atom, one might imagine that a fullerene-like boron cluster would have no π-electrons. But the element has a propensity to promote its σ-electrons into the π-manifold, leaving a σ-hole. So how many π-electrons does B40 have? These sorts of clusters are difficult to build using regular structure editors, and so coordinates are essential. The starting point for a set of coordinates with which to compute a wavefunction was the supporting information. Here is the relevant page: The coordinates are certainly there (that is not always the case), but you have to know a few tricks to make them usable. Why is mercury a liquid at room temperatures? Computational quantum chemistry has made fantastic strides in the last 30 years. Often deep insight into all sorts of questions regarding reactions and structures of molecules has become possible. But sometimes the simplest of questions can prove incredibly difficult to answer. One such is how accurately can the boiling point of water be predicted from first principles? Or its melting point? Another classic case is why mercury is a liquid at room temperatures? The answer to that question (along with another, why is gold the colour it is?) is often anecdotally attributed to Einstein. More accurately, to his special theory of relativity. But finally in 2013 a computational proof of this was demonstrated for mercury. The proof was built up in three stages. Why is mercury a liquid at room temperatures? is licensed by Henry Rzepa under a Creative Commons Attribution-Noncommercial-Share Alike 3.0 United States License.